Examination Date : 15 and 16 April. 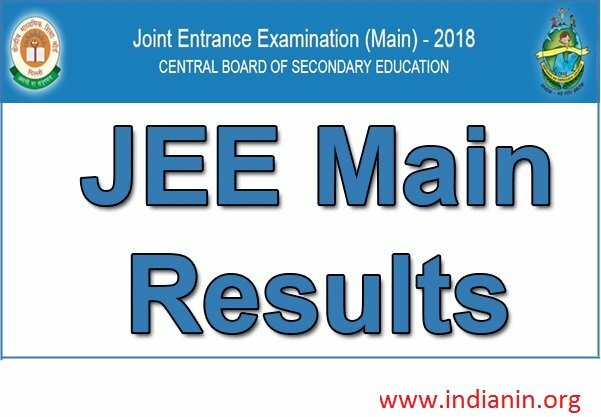 The Central Board of Secondary Education (CBSE) will declare the Joint Entrance Examination – Main (JEE Main) Result 2018 today (April 30). ** The JEE Main Exam is conducted every year for admission to various engineering and architecture courses in National Institutes of Technology (NITs), Indian Institutes of Technology (IITs) and other Centrally Funded Technical Institutes (CFTIs) across the country. ** This year, around 14 lakh candidates took the JEE Main entrance exam to pursue higher education in technical courses. Download the JEE Main scorecards, and take a print out for future reference. ** Only Indian nationals are allowed to fill choices online for counseling in NITs/IIITs/GFTIs because there is a separate DASA channel for Foreign National candidates. ** Since there is no weightage of class 12th marks in calculation of ranks in JEE (Main) – 2018, so, the roll number of class 12th is not verified this year by the CBSE, however, the candidates have to show the marksheet of class 12th (regular/improvement) with 75% marks at the reporting centres at the time of counselling/admission in IITs/NITs/IIITs and other CFTIs. 1. Suraj Krishna Bhogi from Andhra Pradesh topped the Joint Entrance Examination – Main (JEE Main) Paper I, the result of which was declared by the Central Board of Seconday Examination (CBSE), on Monday, April 30 2018. 2. KVR Hemant Kumar Chodipilli Andhra Pradesh, grabbed second All India Rank (AIR) while Parth Laturia from Rajashtan, with 350 marks, secured third rank. This year, around 1135084 candidates appeared for JEE Main 2018 examination. A total of 1,80, 331 boys cleared the exam, with 50,693 girls qualifying for the next stage. Note : The exam for JEE Advanced 2018 will be held on May 20, 2018 for that the registration process will start from May 2, 2018.